The wishing well bonus is usually the least valuable but the most unpredictable of the rainbow riches features, 3 wishing wells would normally award anywhere between £2-£30, 4 wishing wells could award £20-£150 and 5 wishing wells would be anything from £60-£500! The online version would ordinarily offer the same amounts based on a £1 stake. The famous Pots are the most sought after win on all versions of Rainbow Riches, they only appear on the middle 3 wheels and can award very big wins, on the original Rainbow Riches bronze pot would be anything from £50-£100, silver pot can award £150-250 and the gold pots are £400 & £500, the recently popular 'pots of gold' awards progressive pots, starting at £50, £150 & £250 which increase with every game played. 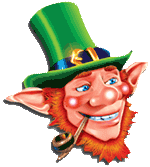 The leprechaun feature is what makes the rainbow riches slot an all time favourite, again this can be unpredictable and award big wins! The leprechauns appear on all 5 reels and no matter how many you get £500 is always achievable! 3 leprechauns would normally pay a minimum of £8, 4 would be a minimum of £20 and 5 is at least £60. Like all fruit machines there are lots of people who try to work out how to play this game but even though patterns do seem to appear these are a random game and should be played as such, it can be a fun game if played within budget, nearly all players will have bad and good experiences of this machine, our best advice is to stay in control and only spend what you can afford, remember that if you do lose it doesn't mean you will have any more chance of winning by playing more. There are many rumours around patterns being seen in the gameplay and we have witnessed some ourselves, for instance 4 wishing wells would often be awarded twice within £20 or so, the original rainbow riches does seem to drop 2 pots in a lot before awarding all 3, and it does sometimes streak for £800+ by awarding 4 wells, then a large win on the lines followed by a pots and a good leprechaun feature, but the mind will always try and find patterns in a random sequence so don't always believe what you see!